Tiree’s roads are almost entirely single track. They may appear to be quiet but they are the main thoroughfares for livestock and island traffic and are used by all types of vehicles including cars, tractors, buses and heavy goods vehicles. 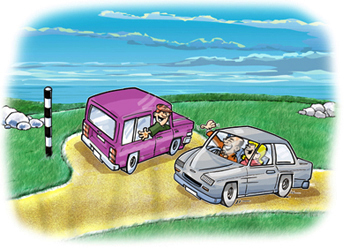 All roads on the island carry the national speed limit so be aware that some people may be driving faster than others. You should always allow faster vehicles to overtake. 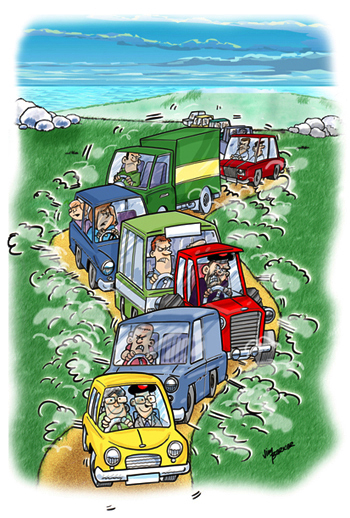 On single track roads you should pull into or stop at the next lay-by to allow the faster traffic to pass. On Tiree, local people who work for the emergency services; doctor, nurses, ambulance, fire service and coastguard, use their own vehicles to attend emergencies. 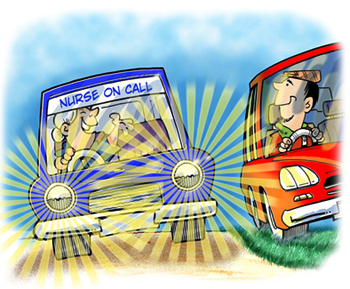 If you see a vehicle with their main headlights and hazard warning lights on, pull over immediately and let them pass. When driving on a single track road and you see an approaching vehicle you should indicate and pull into or stop at the next available passing place on the left hand side. If the next passing place is on the opposite side of the road, you should stop on the left hand side opposite the passing place and wait for the approaching vehicle to enter that passing place. During the hours of darkness, the same procedure is adopted however, switch your head lights to side lights only and keep indicating. Passing places should never be used as car parks. 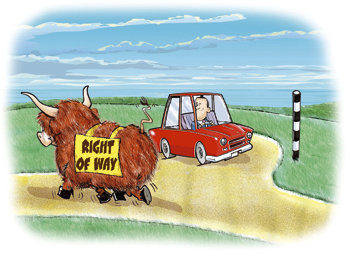 If you meet cows or sheep being herded on the road coming towards you, you should pull over to the left side and switch your engine off until they have passed. If the animals are travelling away from you please wait patiently a good distance behind them until they leave the road or until you are given a signal to pass. 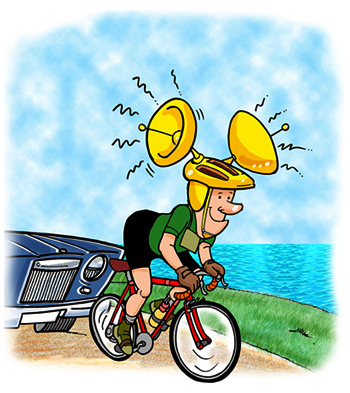 When cycling on Tiree you must be vigilant at all times as the wind can conceal the noise of an approaching unsighted vehicle. 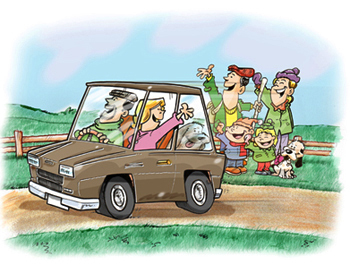 If you meet a vehicle, you should always allow that vehicle to pass. 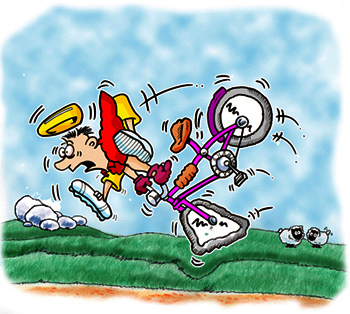 On single track roads you should stop on the left hand side where you are, dismount and move your bicycle onto the verge. Don’t be tempted to simply continue cycling on the verge as most roads have concealed drainage ditches and water ‘run-offs’. If you are walking on the road be vigilant and watch for cars approaching whose sound may be hidden by the noise of the wind. If a car approaches please move onto the verge to give the passing vehicle as much room as possible. If you are walking in a group remain together and stand on the same side of the road. 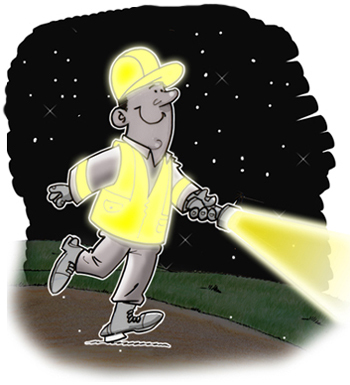 When walking at night you should wear bright clothing and carry a torch.